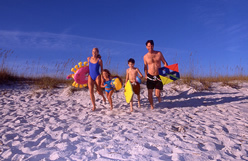 The most effective way to save money when planning a family holiday is to do your research. There are plenty of great deals to be had if you take a little time to find them. Price comparison sites such as travelsupermarket are set up just for this service. Don’t make your decision at the first travel agents you visit, shop around, many have great ‘child go free’ offers that can really help to reduce the price. When you are discussing your holiday with the travel agent make sure you ask if what they are offering is the lowest possible price, there are plenty of added extras that can be removed to make the overall price cheaper, not having the meal on short flights and taking your own packed lunch for example can save up to £15 per person! Now I know what you’re thinking, if money is tight why do I want to pay out for travel insurance? Well if you don’t and something was to go wrong whilst you were away you could end up with a far greater bill than the cost of taking out travel insurance. There are some great family travel insurance policies out there that that can be cheaper than buying insurance for each member of the family individually as many offer free child cover. For great travel insurance deals from moneysupermarket.com. Work out what is best for you food wise before you start looking for your holiday, if you are the type who likes to explore and try new restaurants all inclusive is probably not the best option for you. If you don’t mind staying in the resort complex then all inclusive deals can end up saving you a lot of money as you don’t have to worry about paying for the children to have ice creams and drinks during the day, the costs of which can soon mount up. When you are travelling to and from your destination is another time when costs on food can be a lot more than you initially expected. Take a packed lunch with you, meals and snacks at airports and service stations are significantly more expensive than anywhere else and children can become over excited and irritable if they eat too many sweets whilst travelling. Instead take their favourite packed lunch and a few treats to have throughout the course of the day. Allowing your children to pack their own hand luggage will give them a sense of responsibility for the journey and ensure that they have things to keep them occupied for the entire duration of their travels. If you ensure their backpack is filled with pens, paper, colouring in equipment and one of their favourite toys this should keep them entertained without having to pay for expensive toys and games that are available to buy at airports. The sense of being in charge of their own things will make children more interested in their own special hand luggage they have with them than being distracted by the new toys in duty free. Travel insurance is boring but a necessary evil. If you travel without it and become ill abroad the average cost is £2,040 and if you travel to the USA you could be looking at a hospital visit for around £6,000. To get a cheap deal on travel insurance try one of the price comparison sites, but check the policy carefully as you may find the cost is small and the cover is even smaller. Make sure you get the cover you need; some policies do not cover lost baggage or missed flights or even stolen wallets/purses. It makes sense to get the correct cover even if it does cost a little more than the basic price quoted. If you are travelling abroad more than one in 12 months it may be a good idea to look at annual multi –trip packages instead of buying separate policies for each trip. It is advisable to buy your holiday insurance as soon as you book your holiday as you will then be covered for cancellation costs if you are unable to make the trip. There are many reasons why your travel insurance company will not pay out for a claim, but the most common reason is for pre-existing medical conditions not previously declared. Don’t fall into the trap of thinking if I don’t tell them I can keep the cost down. Should you have to make a claim for medical expenses the insurance companies are able to get access to your medical records and if there is something you have not told them, they can give your claim the payment denied stamp, be warned. Yes, its nearly that time of year again… Halloween is fast approaching and whether you are away on a school half term or staying at home then now is the perfect time to be preparing for your family Halloween party. We usually find ourselves in a caravan over the Autumn half term and over the years we have had some great family fun at Halloween with carving pumpkins to put on display, dressing up as the traditional witch, ghost or other scary character and going to the holiday parks Halloween disco. Below we have included some the things to make a great Halloween night. Putting on your scariest face is easy with this face painting kit containing 8 different coloured non-toxic, water-based face paints, plus a brush and sponge to apply them. You can mix the colours to create new ones, and take inspiration from the instruction booklet provided. These Halloween lanterns will cast an eerie, golden glow over your celebrations. Just pop a tealight into the bottom of each of the re-useable, non-flammable paper lanterns for a truly magical effect. Halloween party, trick or treating or just for fun – children can be a pumpkin, a black cat or a witch with these fantastic masks! Pre-cut elasticated foam mask kits in 3 assorted designs. Easy to make – just glue on the pieces and wear over and over again. Who says witches have to wear all-black? This cute costume is accented with purple or orange! Includes velvet trimmed dress and hat. Available in age 5-7 and age 8-10. It’s the stuff nightmares are made of! Put on this outfit and give your friends the heebie-jeebies! Includes moulded mask, hooded robe and gloves. Available in age 5-7 and age 8-10. Skulls, pumpkins, bats, cats and ghosts – this plastic Halloween cookie cutter set has all the shapes you need for a batch of the creepiest cookies imaginable! Age 3+. You’ve heard of night lights, but what about fright lights? Switch on these spooky ghost and pumpkin lights and they flash in different colours while emitting a truly terrifying noise – just what you need for the scariest night of the year. The lights come with a neckstrap for hands-free operation! Batteries included. Age 5+. Get ready for the beach in the latest SoulStar mens board shorts available in red & white and navy. The all over design includes the SoulStar logo to the pockets. Both boardshorts are currently available from Get the Label with a Buy One, Get One Free offer. If you can’t travel anywhere without your music to hand then this is an esstential item for your packing. You can charge any ZEN, MuVo MP3 player or power your Creative Xmod or Creative TravelSound or TravelDock speakers with the Creative Universal Power Adapter. Simply charge your player with the USB Connector / DC jack, power your Xmod with the USB Connector or even your portable speakers with the DC connector. With six interchangeable plugs included, enjoy its convenience wherever you are in the world.